Getting snowed in has it’s advantages. Fifty inches in one week is enough for any human being. If you are a plastic surgeon fascinated with adult stem cells from adipose fat, it gives one time to transcribe your thoughts. One has more time to reflect, pontificate, and borrow ideas. 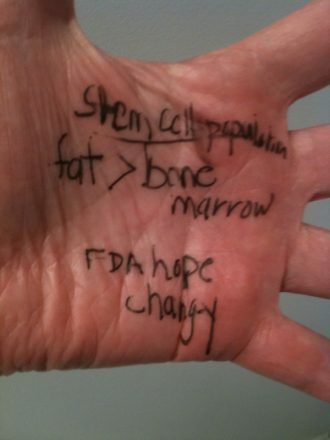 You’ve gotta credit Sarah Palin–the stuff you write on your hand–it’s important stuff. To learn more about adipose stem cells (ASC’s) and how they heal tissue and have the capacity to cure diseases visit our fat stem cell archives.